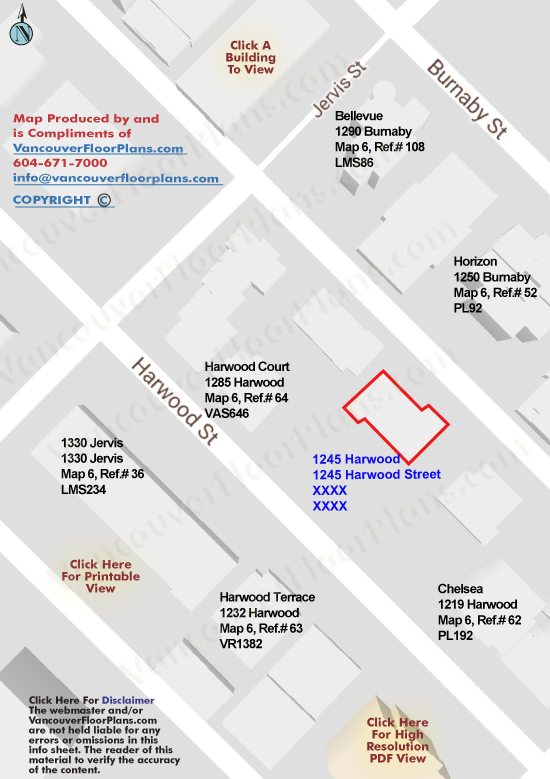 BUILDING WEBSITE 1245 Harwood at 1245 Harwood Street, Vancouver, BC, V6E 1S5, West End Neighborhood,18 suites, 18 levels, built 2016. This website contains: current building MLS listings & MLS sale info, building floor plans & strata plans, pictures of lobby & common area, developer, strata & concierge contact info, interactive 3D & Google location Maps link www.6717000.com/maps with downtown intersection virtual tours, downtown listing assignment lists of buildings under construction & aerial/satellite pictures of this building. For more info, click the side bar of this page or use the search feature in the top right hand corner of any page. 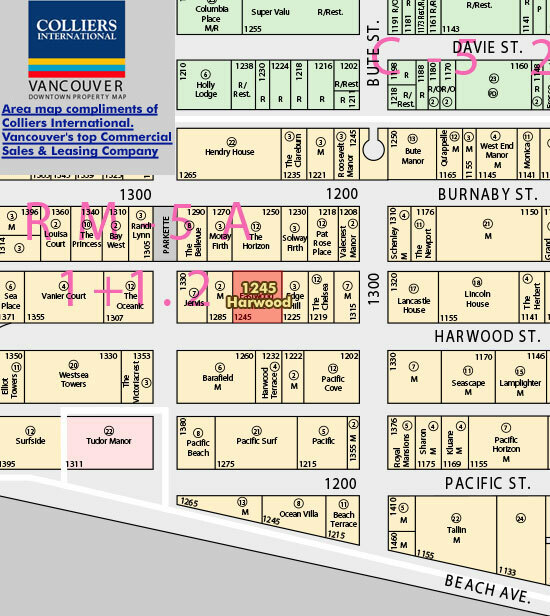 Building map location; Building #004-Map 6, Vancouver West End Area. 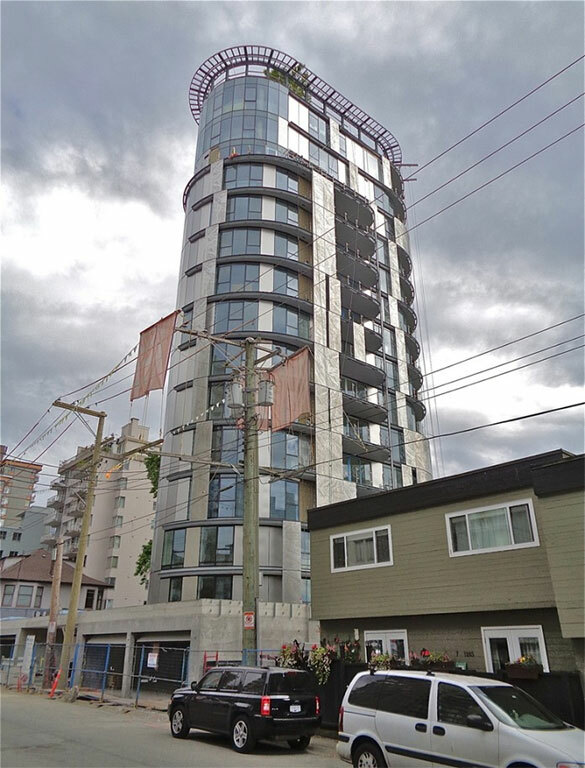 The City of Vancouver required the Developer to replace the 8 rentals that the Legg Residence had because of the ?Rate of Change?policy. When plans were initially submitted, the plan called for 48 units, but that has been reduced to 23. Eight will have to be rental because the city insists any rental units be replaced in any redevelopment. This means there will only be 15 condos in the tower, many of them occupying a whole floor. Council looks at incentives for developer to preserve century-old tree. This is about a tulip tree that knows no property lines. 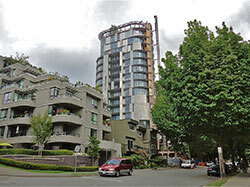 Thought to be a century old, the 45-metre deciduous tree stands at the centre of a development challenge in Vancouver’s West End. 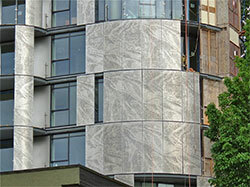 It’s located at 1245 Harwood Street, where Bing Thom Architects has proposed to put up an 18-storey residential tower. The property includes a heritage house that is currently rented. The project’s architect, Dan Du, explained to the Georgia Straight that the developer, Acadia Development Inc., will get to build an additional 45,000 square feet of space in exchange for preserving both the tree and the house. All that is needed is for council to formally award the density bonus. But there’s one problem. 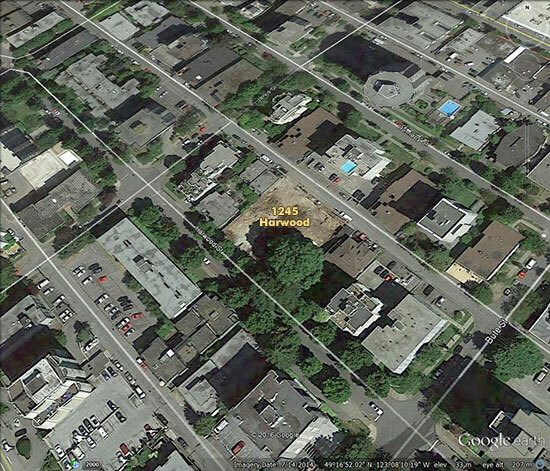 About half of the tree’s roots are in an adjacent lot, according to a Vancouver staff report that came out last month. Its canopy also extends to the same bordering property, whose owners have declined to have their portion of the tulip tree designated a historic landscape resource. Although it’s unlikely that the roots will be deliberately damaged in the next lot, there’s no telling what the owners will do with the property in the future, which puts the longevity of the tree into question, according to the staff report. If the tree dies, the neighbourhood gets stuck with a huge tower and no magnificent tulip tree to marvel at. With no guarantee that the tree can be protected, there’s no sense giving the developer a density bonus, staff reasoned. 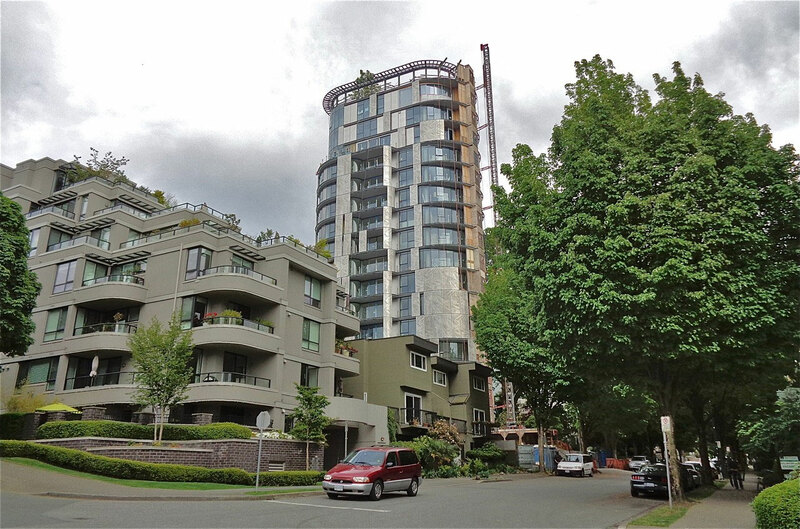 However, the report also indicated that if council doesn’t provide the density bonus, then the developer won’t have any incentive to keep the tree and may just choose to cut it down. The report was withdrawn from council’s agenda on April 22, with staff indicating a desire to look at the matter again. As of May 10, Du hadn’t heard back from city planners as to how the matter will be resolved or when it will go to council for deliberation. 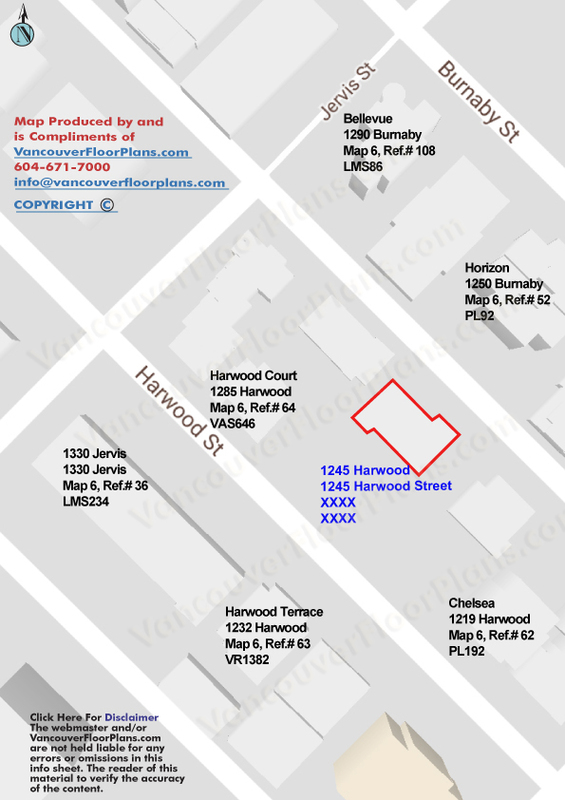 According to Du, 1245 Harwood has an area of at least 16,000 square feet. He said that a quarter of this is proposed as the tree protection area, where absolutely no construction activity will take place. He also said the 45,000 square feet of density bonus were already factored into the design of the proposed 18-storey tower, which will have at least 40 high-end condominium units. 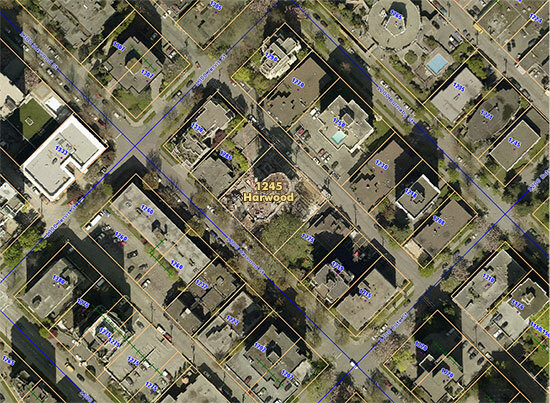 The April 6 staff report noted that the bonus density for the tree is equivalent to about six storeys. 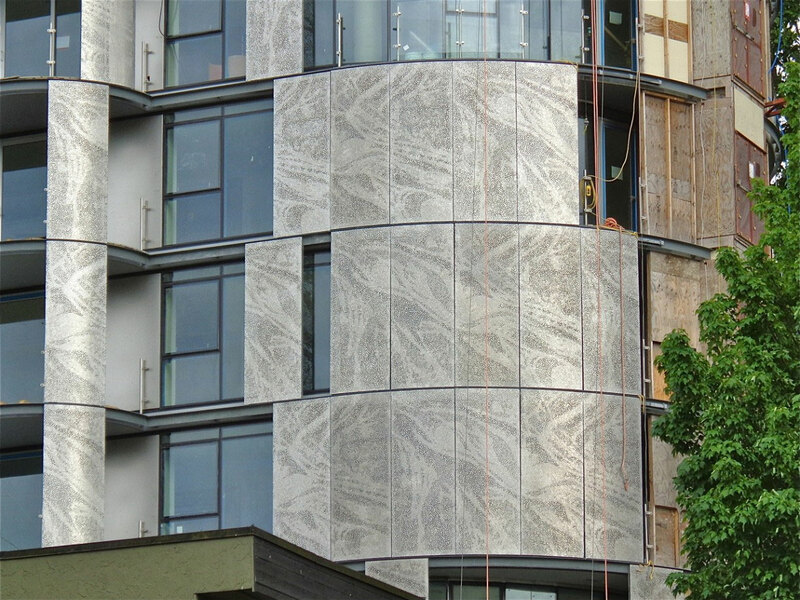 Du pointed out that the tulip tree, the heritage house, and the lot’s beautiful garden form integral pieces of the development plan, and that Bing Thom Architects is reluctant to see any of those gone. “We also want to encourage the public to voice their support for the tree, because we feel it’s very important for the community to find a way to save this tree so it doesn’t get lost in the legal shuffle,” Du said.